DUBOIS – Fall commencement ceremonies at Penn State DuBois are planned for 7 p.m. Dec. 18, in the Hiller Auditorium. All members of the community are invited to support new graduates at the ceremony. Emily Thomas, instructor in Wildlife Technology at Penn State DuBois, will offer the commencement address. Thomas was recognized by the DuBois Educational Foundation as its 2013-14 Educator of the Year. The award is given annually to recognize excellence in teaching. Thomas earned an Associate in Science from the Penn State DuBois Wildlife Technology program in 2007. She then went on to Penn State University Park to earn a Bachelor of Science in Wildlife and Fisheries Science in 2009, and a Master of Science in Wildlife and Fisheries Science in 2011. Thomas has been an Instructor in Wildlife Technology since August 2012. She oversees a student-run songbird banding station and runs a public MAPS (Monitoring Avian Productivity and Survivorship) bird banding station at the Jamestown Audubon Sanctuary in Jamestown, NY. 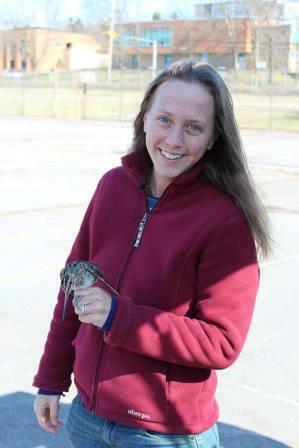 She also monitors American Kestrel nest boxes in Warren County and Chautauqua County, NY and participates in the monitoring of the Northern Goshawk population in Pennsylvania. Professionally, she is the Vice-President of the Pennsylvania Chapter of The Wildlife Society and serves on the board of the Pennsylvania Society for Ornithology.